What better way to start than seeing the latest technologies on offer. “Home Wiring Essentials” has been developed by pretty much everyone in the Australian industry-cabler registrars, NECA (National Electrical and Communications Association), Telstra, Optus, Clipsal, the list goes on. “Home Wiring Essentials” is the only guide to home wiring and cabling you’ll ever need. Well for the foreseeable future any way. It covers the basic areas like communication and entertainment, but also emerging business like smart home devices, electric cars, or intelligent lighting, thermostats and security. 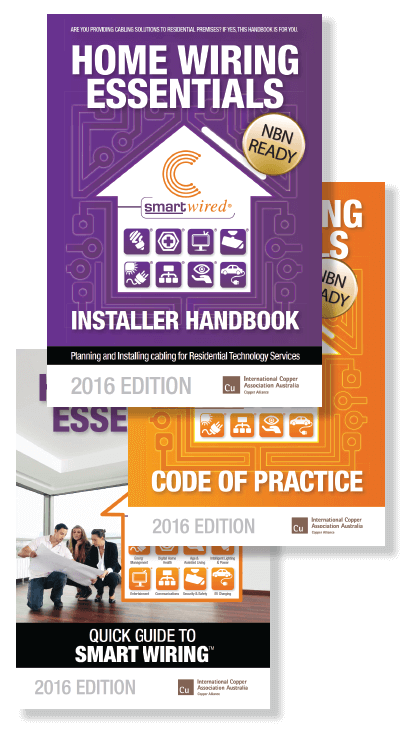 “Home Wiring Essentials” is the Australian Gold Standard in home wiring and cabling for all technologies, including electricity. That means it comes guaranteed by Australian industry to make sure homes work with technology the way they’re meant to. And of course that means making sure homes are ready and wired for the future. Wireless is there for convenience, but wires and cables are there to perform 24/7. “Home Wiring Essentials” also comes with a Quick Guide you can give to your clients so they’re up to speed too. The Australian Registered Cablers website has been designed to provide you with professional, industry backed marketing material that’s supported by cost effective distribution to the door of potential customers in your area. Plus provides prospective customers searching for a cabler, your company information as a registered cabler. ©2018 AUSTRALIAN REGISTERED CABLERS. ALL RIGHTS RESERVED.